Turkish President Tayyip Erdogan addresses Turks living in the United States at a hotel in New York City, Sept. 23, 2018. Turkish President Recep Tayyip Erdogan is in New York for the U.N. General Assembly at a time of high tensions with Washington. But Erdogan's four-day visit could offer an opportunity to reset ties. In a possible move to prepare the ground for a soothing of tensions with Washington, a Turkish official was quoted Monday in the Wall Street Journal, indicating the American pastor Andrew Brunson could soon be allowed to return home. Brunson's trial in Turkey on terrorism charges was the trigger in August for U.S. President Donald Trump imposing trade sanctions on Turkey. The sanctions were the catalyst for a collapse in the Turkish currency. U.S. National Security Advisor John Bolton said relations would reset when Brunson was allowed to return home. Washington calls the charges against the pastor baseless. Erdogan insists Brunson has to stand trial. Analysts suggest the impasse could be broken at the pastor's next hearing Oct. 12. "I would expect him to be released. There is more and more expectation this will happen," said international relations professor Huseyin Bagci of Ankara's Middle East Technical University. "But we have to wait until October 12 if pastor Brunson is released. Then the problem is solved automatically." "The fiery rhetoric is much less than a couple of weeks ago between Ankara and Washington. Both sides, it seems to me are taking steps back, cooperation is urgently needed on both sides," he continued. 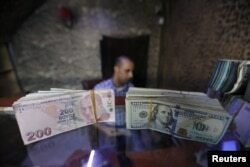 FILE - Banknotes of U.S. dollars and Turkish lira are seen in a currency exchange shop in the city of Azaz, Syria, Aug.18, 2018. Easing Turkish-U.S. tensions and the removal of the threat of further sanctions is vital to ending Turkey's financial turmoil. But apparent miscommunications between Ankara and Washington continue to dog relations and threaten to exacerbate tensions. The latest diplomatic spat erupted over apparent efforts to bring the two presidents together in New York. The two presidents are not scheduled to meet. "U.S. representatives keep saying they will evaluate a request for a meeting with Trump if one comes from [Turkish] President Erdoğan or the Turkish side," said Omer Celik, spokesperson of Erdogan's AKP Party. "We don't appreciate such a tone," he continued, "but I can tell you that if the American side, if President Trump, wishes to meet our president, we will look at their request and evaluate how to respond to it." 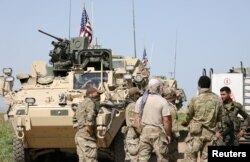 FILE - Kurdish fighters from the People's Protection Units (YPG) chat with members of U.S. forces in the town of Darbasiya next to the Turkish border, Syria, April 29, 2017. Erdogan sent a reminder of the potential for a further escalation in bilateral tensions over Syria. In a speech Monday in New York, the Turkish president warned his armed forces are ready to launch an offensive against the Syrian Kurdish militia, YPG. The YPG is a crucial ally in the war against Islamic State and about 2,000 U.S. troops are deployed with the militia where Erdogan is threatening to attack. Ankara calls the YPG terrorists, accusing the group of being linked to a Kurdish insurgency in Turkey. "It is of serious concern to us that the American administration maintains its partnership with the YPG and PYD," Turkish presidential spokesman Ibrahim Kalin said last Friday. Analysts say Ankara is increasingly alarmed that Washington will continue backing the YPG after the defeat of IS, as part of efforts to curtail Iran's influence in Syria. Last week Trump said, "We're very close" to defeating the Islamic State in Syria, "and then, we're going to make a determination as to what we're going to do." On Monday, Bolton said "we're not going to leave as long as Iranian troops are outside Iranian borders and that includes Iranian proxies and militias." Erdogan has indicated he is prepared to reach out to Moscow for support in his goal to eradicate the YPG in Syria. Turkish-Russian relations have markedly improved in the past 18 months as the two countries deepen cooperation in Syria. FILE - Turkish President Recep Tayyip Erdogan (L) speaks to Russian President Vladimir Putin, during their meeting in the Bocharov Ruchei residence in the Black Sea resort of Sochi in Sochi, Russia, Sept. 17, 2018. Turkey's relationship with Russia is another point of friction with Washington. Ankara is facing additional U.S. sanctions if it proceeds with a planned purchase of Russia's S-400 missile system. NATO warns the system's deployment threatens to compromise its military hardware. Analysts say Erdogan's deal this month with Russian President Vladimir Putin that averted a Damascus offensive against the Syrian rebel enclave of Idlib sends a timely message to Washington of Turkey's importance in the region. "It's clear Turkey is not an expendable country. Turkey is a sort of anchor for Western strategy in the Middle East," said Aydin Selcen, a former senior Turkish diplomat who served both in Washington and across the region. "It is in the interests of the United States to work with Turkey. However, early November is approaching, which is when the U.S.-Iranian sanctions will be in place, and that will be the biggest test for Turkey-U.S. relations." Washington is due to impose sweeping new trade and financial sanctions on Tehran over its nuclear program. Ankara has repeatedly warned it will not back the new measures.